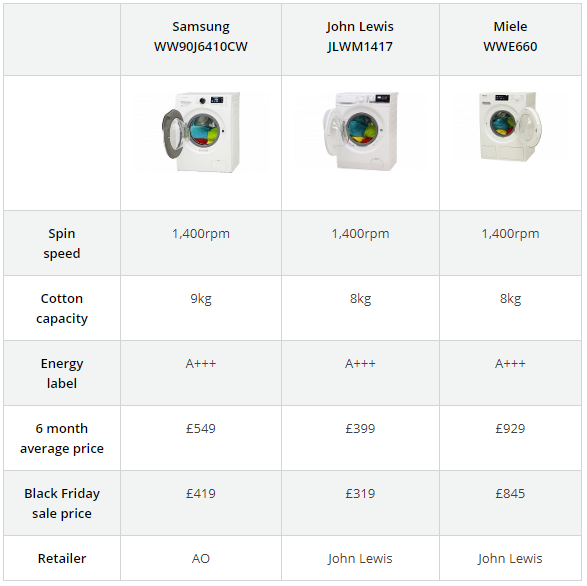 We’ve tracked Black Friday washing machines prices from Argos, AO.com, Currys PC World and John Lewis advertised between 17 and 19 November to reveal our pick of those that yield a real discount – and the ones that don’t. Our snapshot pricing investigation exposed a number of products that were cheaper in the preceding six months at one of the major retailers (Argos, AO.com, Currys PC World or John Lewis). We also discovered that the washing quality from the models being promoted, regardless of the saving, really varied when we put them to the test; proving that what seems like a bargain in store, could leave you with a dud washing machine at home. Black Friday deal prices are constantly shifting. 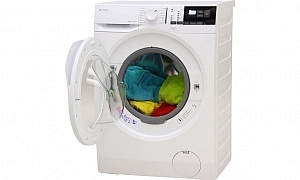 Make sure you check our washing machine reviews before you buy to see if it’s a bargain. 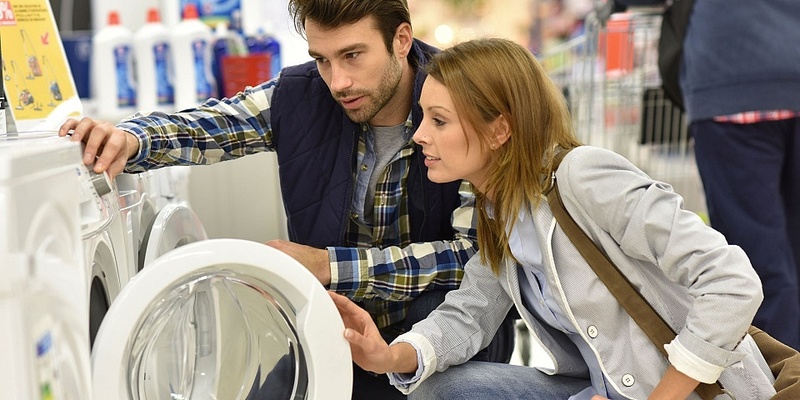 These are our pick of the washing machine deals for Black Friday. This Samsung washer uses Ecobubble technology – a process that mixes your detergent and water before it goes into the drum. The idea is to improve cleaning power and to make the machine easier to use. It comes with a 9kg drum, which is perfect if you like to wash your clothes in bulk. 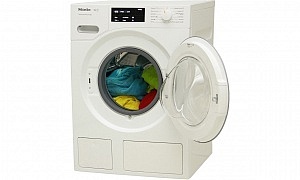 Although, this also means that it’s boasts larger dimension than most washing machines. Remember this if you’re planning to squeeze your new appliance into a compact kitchen. The average monthly price for this three-year-old model over the past six months has been just under £550. But AO.com has listed it for £419 for Black Friday – giving you an impressive saving of £130. But does it remove stains and rinse clothes well? Our full Samsung WW90J6410CWreview reveals all. The selection of specialised wash programs sets this model apart from others on the market. Along with all the usual – cottons, delicates, eco etc – you’ll also find settings for denim, duvet and outdoor wear. Even better, John Lewis also claims that the A+++ start rating for this model makes it super-efficient to run – which implies the savings won’t stop after you take it home. £319 is the best price we’ve ever seen for this washing machine, with it typically costing £399 or more over the past six months. But none of that matters if it can’t clean your clothes to a high enough standard. 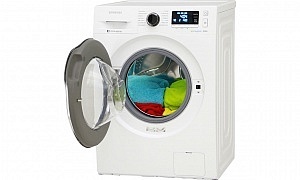 Find out if this is a bargain worth bagging in our John Lewis washing machine review. If you’re planning on pushing the boat out this Black Friday, then the Miele WWE660, a washing machine costing upwards of £800 could be for you. Jam-packed with impressive tech, the TwinDos has wi-fi capability and an auto-dose function, which means you don’t have to top up detergent every time you set a wash. The average price for this model is £929, so getting your hands on one for £845 will give you a big saving. And let’s face it, any discount on that price would be welcome. Is it really worth it, though? Our Miele WWE660 TwinDos review reveals all. Don’t panic purchase. Jump straight to our Best Buy washing machines to do your research before choosing your new washer. While you can find many good deals during the Black Friday sales period, there is also a high chance you could invest in a product that is cheaper at other times of the year. For example, the Indesit IWME127, an integrated washing machine that launched back in 2014 has been on sale for most of the year at around £239. But in the run up to Black Friday we’ve spotted it at Argos for £299. The recently launched Bosch Serie 6 i-Dos is being promoted at Currys PC World. Our tracking showed an average monthly price for this model across retailers was £379, but it’s currently on offer for £569 – that’s £190 more than you could have previously bought it for. Currys PC World has also advertised the Zanussi ZWF81441W at £289. But this is actually £38 more than the average monthly price across retailers and a whopping £75 more than the lowest we’ve seen it sold for (£214). A Don’t Buy washing machine skips stains and leaves detergent on your clothes – these are the worst washing machines you should avoid. All prices correct as of 22 November 2018. Except *which had gone up by another £10 on this date.